Proper Tree Mulching around trees is one of the most beneficial practices a homeowner can use for better tree health. So what is mulch? Mulches are materials placed on top of the soil to keep moisture in and improve soil conditions. However improper mulching materials and deployment may have little or even negative impact on the trees in your landscape. There are two types of mulches out there an organic or non-organic mulch. All inorganic mulches do not decompose and don’t need to replenishment often. However, they don’t improve the soil structure by adding organic matter or nutrients to the soil. Organic mulches decompose at varying rates depending on the material, climate and soil microorganisms. Mulches that decompose fast must be replenished more often. Most people prefer organic mulch since it adds to the soil structure. First Determine whether soil drainage is adequate and if there are plants that may be affected by the choice of mulch. Using a slightly mulch, such as pine bark may be beneficial to some plants. For well-drained areas, apply a 2- to 4-inch layer of mulch (less if poorly drained). Coarse mulches may be applied slightly deeper. Ideally, place mulch out to the edge of a tree’s crown. If mulch is already present, check the depth. If adequate mulch is present, break up any matted layers and refresh the surface with a rake. If mulch is piled against the tree trunk, move it back several inches to expose the tree trunk. 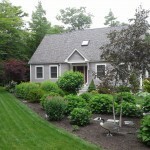 If you’re looking for landscaping services in New Hampshire, contact the experts at Elf’s Landscaping today! Based in Rochester New Hampshire we service the surrounding communities of Portsmouth, Dover, Somersworth, Newington, Exeter, Durham, Berwick Maine, and Kittery Maine. Tagged Bark Mulch, Compost, Mulch, Tree Care. Bookmark the permalink.